My exhaustion from both morning and afternoon dive training, lectures, meetings, and snorkeling finally hit me last night, but the species of sea life that I have been able to observe these past few days on my adventures to the lagoon, down to the blue hole, and the Eco-Reef were priceless. I was extremely horrified about diving yesterday because I had some trouble finishing my training and after breaking a part of my snorkel, my fin, and scratching part of my eye on a tree. Thus, I thought my first open water dive would end in either vomiting, nausea, or death. I’m not the best swimmer so I prepared myself the night before by refreshing my memory with the PADI dive training videos, but even then, I was extremely nervous. Luckily, I had the best roommates, dive buddies, and instructors to make me feel more comfortable on my dive yesterday morning. Yesterday at 6:30am was the first open water dive for all the “DITS” or what Professors Warren and Peterson call “Divers in Training”. All eight of us woke up yesterday at 6am and we all made our way to the dock to gather our BCDs, Regulators, Air Tanks, and scuba gear while we watched the sunrise. After our gear was all set up, we walked to the picnic tables to go over a lesson on the hand signals and tasks we would be performing under water for open water dive #1. Then we finally made our way to the two boats which would take us to Eco-Reef, but unfortunately one of the boats wasn’t working so we all shoved into one boat which delayed our trip. Once we finally all got onto the boat, we took off with the sun beaming on us around 7:40am. 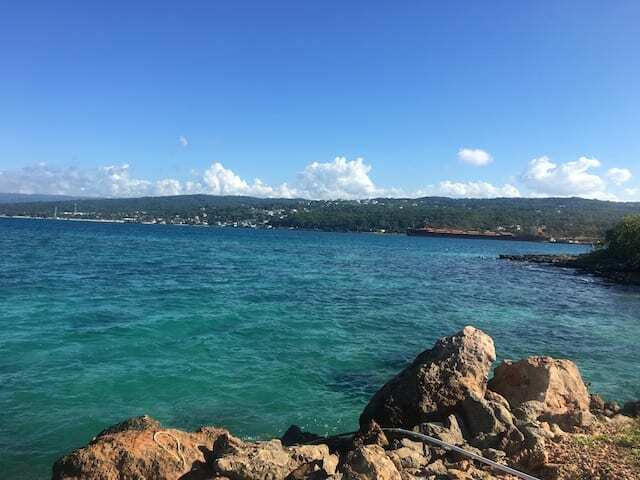 The gorgeous scenery of aqua/green colored water was breathtaking and got my mind off the fact that I would be diving into the ocean at 45 feet doing exercises that I struggled with in a 6ft pool during dive training. After jumping into the water at 8:10am, we did some exercises above the water and then again around 10 feet under water before slowly progressing to 45 feet down the reef. It was difficult focusing on my surroundings while trying to master the exercises, but I did see some awesome corals and fish that I had not seen snorkeling. After getting down to 45 feet, it didn’t feel as deep as I had thought and my only issues were clearing water out of my mask, equalizing the pressure from my ears, and controlling my breathing so that I would not float back up to the surface (at one point I ended back up to the water surface because I was breathing too quickly and had separated from the group). I was proud of all of us “DITS” for surviving our first dive today and doing so well. After our first dive finished at 8:45 am, we rushed to breakfast and then quickly jumped back in the water for open water dive #2. We were definitely more confident the second time around and were able to focus on the sea life more; some of us touched sea cucumbers and a couple of other students accidentally got close to a stingray and saw angel fish. 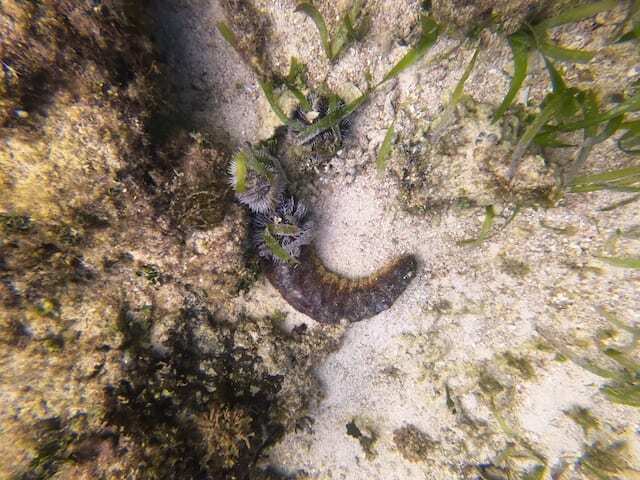 The sea cucumber we had learned was Hollothuria mexicana. After our final dive for the day, we headed back for a quick lunch then lecture where we had our first quiz. Then we had a couple of hours to study or snorkel before out next quiz and lecture. I had been extremely busy these past couple of days with dive training on top of our other activities, so I decided to spend my free time catching up on lectures to cram for our first quiz right beside the water. The view I had while studying. Finally, to end the day, we enjoyed fish, chicken, salad, and ribs for dinner before our final meeting to fuel us for today for our open water dive #3 and #4 which we will be completing today at 6:30 am again. I hope all goes well today because we will all finally be certified! This entry was posted in Uncategorized by joe.warren@stonybrook.edu. Bookmark the permalink.